Fluid seeps from beneath the surface from point-source locations leaving dark streaks. The flow spreads out downhill, cascading over ridges. Initially almost jet black, it then stains the surface with a pale color, possibly caused by minerals from below the surface. 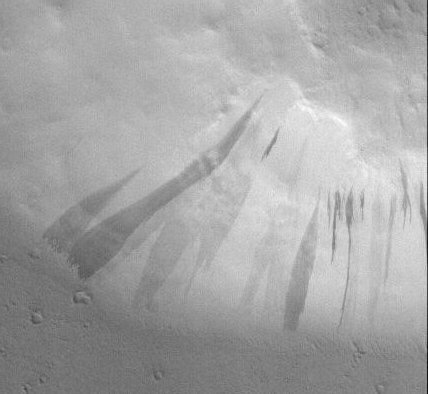 Hundreds of these seeps seem to be localized in two antipodal areas, areas on opposite sides of Mars. JP Levasseur is responsible for the content of this site. Viking and MGS images courtesy NASA/JPL.